Last Thursday, Common Cause in Wisconsin sent Wisconsin U.S. Senator Tammy Baldwin this letter, urging her to support the strongest filibuster reform measure that the United States Senate is expected to consider when it grapples with this matter this week -- perhaps, even as early as today. Yesterday, Senator Baldwin's office contacted CC/WI and informed us that she was signing on as a co-sponsor and would vote for the Merkley-Udall Resolution that would preserve the filibuster option but require that it be a "real" one -- with non-stop talking and holding possession of the Senate floor as the filibuster used to be for years, when it was a legitimate tool for what formerly was known as the "world's most deliberative body." Now, a U.S. Senator has to do little more than scratch his or her nose, to block action and thwart the will of the majority of the citizens of the nation in stopping even the consideration of any piece of legislation. That was not what the founders intended. For more detail on this matter, go here. Senator Baldwin deserves praise and has our thanks for stepping forward and taking a leadership role in this important matter. Thanks too, to all of the Common Cause in Wisconsin members and other citizens who care about good government and democracy and who contacted Senator Baldwin over the last five days in support of Merkley-Udall. She has demonstrated to Wisconsin that she listens and is responsive to our communications with her. After the November election last year, the Common Cause in Wisconsin State Governing Board met and hammered out a list of reform priorities that we are pursuing in 2013 -- with redistricting reform at the top of the list. We will have much more to say about those initiatives in the weeks ahead. But a couple of other critical issues have come across our radar screen and need to be on yours as well, as a result of breaking news developments in the new year. 1. Republican Jeff Fitzgerald was elected to the Wisconsin Assembly in 2000 and rose to become the Assembly Speaker in 2011 -- orchestrating one of the most tumultuous and divisive legislative sessions in Wisconsin's history. Then, last year, he made a seemingly halfhearted run for the Republican nomination for U.S. Senate, finishing a distant fourth in the field of four major candidates (behind Tommy Thompson, Eric Hovde and Mark Neumann). Some observers suggested that Fitzgerald ran, not to win, but rather to increase his statewide visibility to help him when he changed careers to do what he was really intending to do all along -- become a well-compensated Capitol lobbyist. In early January, newly-former Speaker Fitzgerald registered to lobby for School Choice Wisconsin which has also hired another former Republican Speaker-turned lobbyist, John Gard of Peshtigo. This organization also have ties to yet another former GOP Assembly Speaker -- the disgraced Scott Jensen, who was criminally charged in the infamous Legislative Caucus Scandal that engulfed state government in 2001-2002. Fitzgerald Consulting, LLC of Horicon, Wisconsin may attract other well-heeled clients besides the lavishly funded School Choice organization because of the perception that a recent Assembly Speaker still has a lot of influence and clout with his former colleagues in the majority party in the Legislature. Clearly, Fitzgerald would have an advantage in advancing the interests of those clients better than other, less well-connected, lobbyists. Which is exactly the problem. Jeff Fitzgerald is hardly the first legislator to cash in immediately after leaving the Wisconsin Legislature. But he ought to be the last. Since 1997, CC/WI has advocated for at least a one-year "cooling off" period for an ex-legislator before he or she begins influencing his or her former legislative colleagues. For a number of years our champion on this legislation was former Republican State Representative Stephen Freese of Dodgeville. We are currently searching for a new champion. Of either political party. Legislators of both parties ought to support this. Minnesota has a one-year "cooling off" period for legislators; in Iowa, it is two years. Michigan has a limited cooling off period which needs to be extended according to observers there, but in Wisconsin there is nothing. We do have a one-year cooling off period for state public officials, but not legislators. Most of the 50 other states have something stronger than Wisconsin. Even states like Alabama and Louisiana -- not usually known as pillars of "good government" -- have two-year cooling off periods for legislators. Mississippi, usually the worst state in the nation for almost anything, has a one-year cooling off period. Why not Wisconsin? Take a look at what other states do and see for yourself how far behind Wisconsin lags in this area -- as we do in so many others. There is even a one-year cooling off period for Members of the U.S. House of Representatives and the U.S. Senate. But again, nothing in Wisconsin. The Wisconsin State Journal issued a powerful editorial recently calling for a one-year cooling off period for legislators before they can begin strong-arming their former legislative colleagues (and the editorial cited CC/WI's efforts in this struggle). 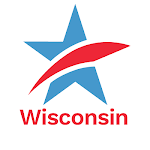 That editorial was re-run in newspapers all over the state in recent days including the La Crosse Tribune, the Appleton Post Crescent, the Stevens Point Journal, the Wisconsin Rapids Daily Tribune and others. 2. In November, 2012, President Barack Obama won re-election with 332 electoral votes over challenger Mitt Romney, who won 206 electoral votes. Obama also easily out-polled Romney in the popular vote count by more than 4.5 million votes nationwide. So Obama won a significant majority on both counts, unlike in 2000, when Texas Governor George W. Bush lost the nationwide popular vote by 543,895 to Vice President Al Gore but was awarded Florida, and a 271 to 266 electoral college vote victory and thereby, the U.S. Presidency in a 5 to 4 U.S. Supreme Court decision. A number of very high level Republicans are not only very unhappy with the outcome of the 2012 Presidential Election -- which was described by many neutral observers as an Obama landslide -- but they are working on a scheme to ensure that a Democratic Presidential candidate will not win the Presidency any time soon -- even if they win a plurality of the popular vote and a majority of the electoral college votes under the current system. Wisconsin Governor Scott Walker, new Republican Assembly Speaker Robin Vos and, most significantly, failed Wisconsin State Senate candidate in 2002 and the current Chairman of the Republican National Committee, Reince Preibus, have all spoken favorably of this partisan scheme to change 224 years of American law -- dating back to George Washington -- with regard to how we elect the President of the United States. The scheme? To award the electoral votes to a candidate on the basis of who wins the most votes in each congressional district instead of the 224-year old provision in law that awards a state's electoral votes to the candidate for the Presidency who wins the most votes in that state. And of course the reason these Republicans want to do this is because Republicans currently hold a majority of the seats in the U.S. House of Representatives and are likely to maintain that majority for years to come because of the partisan gerrymandering (redistricting) of congressional and state legislative districts that occurred in 2010 by majority Republican Legislatures all around the nation, including in Wisconsin. Had this been in place in Wisconsin in 2012, Obama, despite winning the popular vote in the state by more than 205,000, would not have taken all of our 10 electoral votes. Romney won a majority in five of Wisconsin's eight congressional districts so he would have been awarded five electoral votes and Obama five -- one for each of the three congressional districts in which he had more votes than Romney and the two electoral votes alloted to every state for their two U.S. Senate seats -- which are awarded to the candidate who tallies the most popular votes in the state. If you have not done so already, you must read this excellent exposé by Brendan Fischer of the Center for Media and Democracy on this critical matter. What can you do about this and about the disgraceful revolving door situation we currently have in Wisconsin with regard to legislators being able to immediately cash in and lobby their former colleagues? Contact both your State Senator and your State Representative; their addresses, emails and phone numbers can be found in the State Senate and Assembly directories. If you are not sure who your state legislators are, you can look them up here. Here is the message to legislators on the revolving door problem: "Wisconsin Legislators ought to have to wait at least a year before they can lobby their former colleagues. Support legislation to require a one-year "cooling off" period. Better yet, please take the initiative yourself and initiate legislation that would accomplish this!" Here is another message to call, write or e-mail to both your State Senator and your State Representative: "Any scheme that would award the electoral votes for President to a candidate on the basis of who wins a congressional district rather than who wins the entire state and the most votes is fraudulent and undemocratic. If such a measure is introduced in Wisconsin, I demand that you oppose and speak out against it." On behalf of the nearly 3,000 members of Common Cause in Wisconsin, I’m writing to ask that you please join S. Res. 4 as a co-sponsor. This resolution, sponsored by U.S. Senators Jeff Merkley of Oregon and Tom Udall of New Mexico, is a comprehensive filibuster reform package that will restore accountability and transparency to Senate procedures. S. Res. 4 would make it harder to filibuster, but still preserve the ability of the minority to hold up legislation and nominees with extended debate. Senators seeking to prevent the majority from acting would need to hold the floor continuously, in the style of Mr. Smith Goes to Washington. Eliminate filibusters on motions to establish conference committees. Your support of S. Res. 4 would be most welcome. Thank you for your consideration, and congratulations on your new position in the United States Senate. We know and trust that you will represent Wisconsin ably. 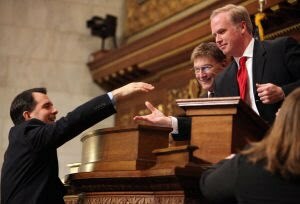 Then-Assembly Speaker Jeff Fitzgerald, right, shakes hands with Gov. Scott Walker last year at the state Capitol. Fitzgerald registered this week to work as a private lobbyist. Former Assembly Speaker Jeff Fitzgerald just left his seat and leadership position in the state Legislature. Fitzgerald is the latest in a long line of state lawmakers — Democrats and Republicans — who swap public service for more lucrative careers as private lobbyists. It's a revolving door that Wisconsin allows to spin far too fast. I have always thought that it was sensible, logical, and civilized to confine the possession of weapons the only purpose of which is to kill people to those who police and defend us. The paranoids at the NRA thought otherwise, and they have unaccountably won the day almost everywhere almost all the time. By another odd coincidence this massive, countrywide reaction to what happened to those children in Connecticut came at a time when the legislatures which must be equally horrified and motivated to do something, anything in response have less and less reason to be fearful of the reprisal of this and all the other single-issue bullies who have been playing such a damaging and prominent role in our less-than-representative democratic system. Fitzgerald's successor in the Legislature had just been sworn into office on Monday when, a day later, Fitzgerald registered to lobby for American Traffic Solutions. By Thursday, Fitzgerald had added another client: School Choice Wisconsin. Most states have laws controlling this troubling practice. The quick transition from public servant to hired gun threatens the integrity of state government in two ways. First, the revolving door mixes public and private interests in a potentially corrupting relationship. A lawmaker might well be influenced in public duties by the promise of a lucrative lobbying job. The result could be policies that serve a private interest rather than the common good. Second, a former lawmaker has connections especially valuable to a lobbying firm. Not only do those connections allow the former lawmaker to cash in for personal gain on experience as a public servant, but they also create opportunities to abuse the public process for the private benefit of clients. Iowa bans lawmakers from lobbying for at least two years after they leave office. Even Congress has adopted this rule. The two-year delay diminishes a public official's immediate influence, power and knowledge. "So it doesn't appear there's some untoward or inappropriate ability to influence public decisions," said Jay Heck, executive director of Common Cause in Wisconsin. "It's just incredibly unseemly for someone to occupy a position of influence and power in the Legislature and then trade on that almost immediately afterward in a lobbying position." Heck's good government group long has pushed for legislation to guard the revolving door. The new Legislature should finally get this done.